http://villagegamessdg.blogspot.com/ is a blog just opened by some SBH players in Anoka, Minnesota. It's a large group playing at Village Games. 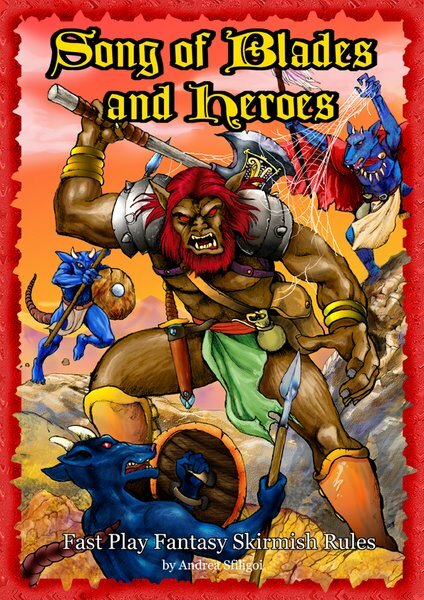 Song of Deeds and Glory is an expansion for the popular Song of Blades and Heroes miniatures rules. It features all the rules and guidelines needed to run extended campaigns, taking warriors from green recruits to grizzled veterans. Now players can send their warbands on the path to conquest and carve out their own territories! The aftermath of battle: will your heroes live or be horribly crippled? Rosters: 36 new creatures such as the Minotaur Skeleton, the Dwarf Gunner, Insectoids, Automatons, and the powerful Kryxxtendrella, Queen of Dragons! It will soon be available on sabersedge and wargamedownloads. The print version will be available in the next few days. Check this space! This is Ganesha's program at Origins 2009 (Columbus, OH, June 24th to 28th). Make sure you come at our tables if you attend, and please vote for our Song of Drums and Shakos napoleonic skirmish rules in the Best Historical Miniature Rules award. All our events are ongoing -- short scenarios repeated during the day, so check the Origins guide for details and hours. Fear and Faith demo game. Zombie survivors must recover a crate of grenades in a zombie-infested area. Song of Drums and Shakos demo game. A meeting engagement near a village. The SDS scenario will be repeated every day with different forces. Playtest game of Tales of Blades and Heroes, the RPG based on SBH. Tales of Blades and Heroes playtest in the night. Also remember that there will be other SBH and MDRG tables in the miniature hall, and that Splintered Light Miniatures will be demoing Song of the Splintered Lands. Song of the Splintered Lands available at Origins! 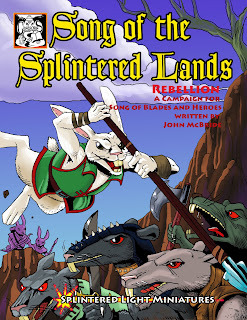 SONG OF THE SPLINTERED LANDS, a supplement for Song of Blades and Heroes joint-produced by Ganesha Games and Splintered Light Miniatures, will be available as a printed book at Splintered Light Miniatures' booth at Origins 2009 (Columbus, OH, June 24th-28th). The author John McBride will run games of SSL every day. Kid friendly, this is a great game system for father/son (or parent/child) gaming. Prizes for all participants. Our Napoleonic fast play skirmish rules "Song of Drums and Shakos" written by Sergio Laliscia have been nominated at Origins 2009 in the best historical miniature rules award. Andrea Sfiligoi of Ganesha Games will attend Origins and will run ongoing demo games of SDS and other games -- if you attend this great con (Columbus, OH, June 24th-28th)remember to look for our table and vote for us!